Alternaria fungus is transmitted through seeds (seedborne). The fungi colonize the seed coat during the seed development stage and when the seed germinates, they become active. The fungal disease causes damping-off and stunted seedling. Infection develops so slowly that a symptom only appears when the seedlings are transplanted in the field. The leaf spots vary in sizes from very tiny spots up to 5 cm in diameter. The spots begin as small yellow or brown spots that slowly enlarge to about 5 cm in diameter, dark colored spots with concentric rings. When all the spots join together, the leaves will turn yellowish or blackish and drop off. 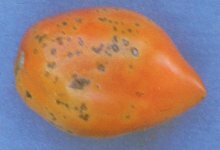 Alternaria stem canker (lesion) on tomato appears on stems, leaves, and fruit. An infested stem near the soil line has dark-brown to black cankers with concentric rings. When the lesions enlarge, they girdle the stem and eventually kill the plant. Fruits that are harvested from infested plants have brown or black necrotic sunken (submerged) lesions. On cabbage, the initial symptom appears as small dark-brown to black or sooty-black spots on the leaves. The infection becomes evident as the spot becomes bigger because it has a darker center than the rest of the lesion. When all the spots meet, the leaves will turn yellow and die. Infected cauliflower and broccoli heads have brown to black spots on florets (small flowers), seed stalks, and seedpods that makes them unmarketable. Infected carrot seeds will fail to germinate and infected seedlings die after emergence, having the damping-off symptom. The infected leaf and leafstalk have dark-brown to black spots with yellow edges. As the spots get bigger and merge, the whole leaf becomes blackish causing the whole top to wilt. The loss of leaves causes poor growth and small carrots. Infested taproot is surrounded by patches of black rots.